Acer announced Acer Aspire S5 Ultrabook back in January at CES, now, five months later, it's finally going on sale in the U.S. and will be available the last week of this month for $1,399. The Aspire S5-391-9880 is a 13.3-inch light weight Ultrabook with 1366 x 768 display powered by a 3rd Generation Intel Core i7 processor. It features a 256GB solid state drive, innovative MagicFlip I/O Port (pops out to reveal ingeniously hidden ports, such as USB 3.0, HDMI and Thunderbolt), a 1.3 megapixel HD webcam and is Acer's first product in the U.S. to ship with AcerCloud (allows user with remote access to the digital data residing on their Ultrabook via their Android tablet or smartphone). 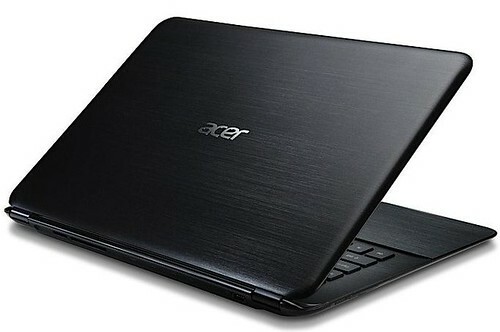 In addition, Acer's first Ultrabook, the Aspire S3, gets refreshed with the 3rd Generation Intel Core processors and a new champagne color and will now offer it with an Ivy Bridge Core i7 processor and 256GB hard drive. The starting price has dropped to $648 with a Sandy Bridge CPU and range up to $999.99. The new Aspire S3 Series Ultrabooks will be available beginning next week at leading retailers across the U.S.